WE HAVE RESTROOM ON BOARD! The only shuttle company with restrooms on board. are provided by Alaska Cruise Transportation - ACT Big Bus. Our schedule is directly coordinated with each cruise ship arrival and departure. You will never be late for your ship or late disembarking off your ship! Drop off directly at Whittier cruise ship or Anchorage (airport or hotels). Pick up at Whittier cruise port at 8:45AM, drop off Anchorage at 11:45AM Anchorage pick up Morning 9:30-10:30AM and Afternoon 12:30-1:30PM. Pick up at Whittier cruise port at 8:45AM, drop off Anchorage at 4:00PM. FAMOUS ALYESKA TRAM INCLUDED WITH LUNCH AND MUCH MORE! Drop off directly at Anchorage (airport or hotels). Add Anchorage city tour to your transfer, we will pick you up from the airport or any hotel included in the price! 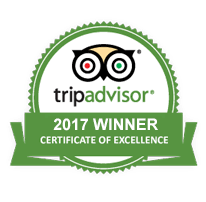 Let us show you all the sightseeing and historic sites that the city has to offer. Take advantage of our fully narrated and guided city tour with photo stops along the way. 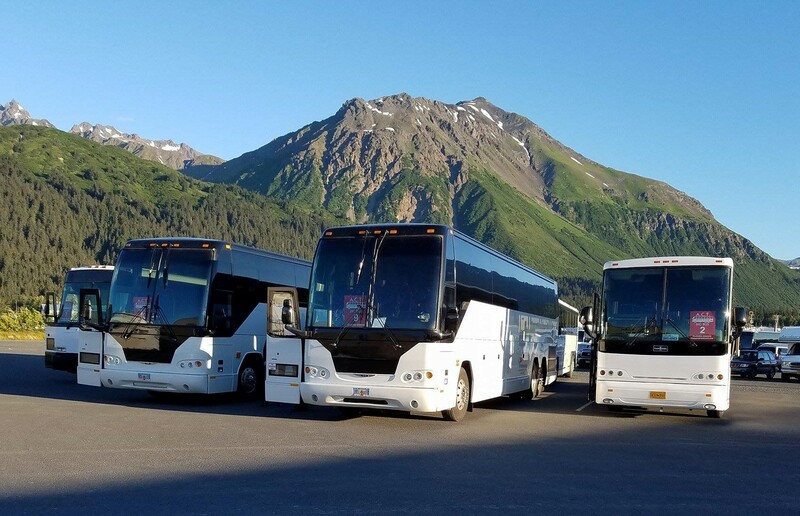 Rent or Charter a Private Alaska Coach Bus For Your Group – Alaska Bus Rental, Custom Group Bus Tour, Anchorage Conference, Anchorage Airport shuttle. 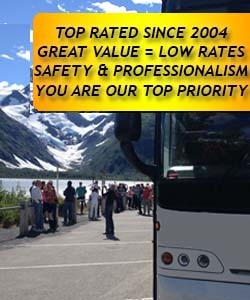 We offer affordable Alaska Bus Rental. 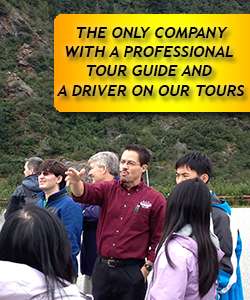 We charter Alaska buses for custom tours and private groups transportation to any destination in Alaska. We also offer Anchorage airport transfers for any hotel in Anchorage. We provide affordable ground transportation for any conferences or events in Anchorage. Our fleet includes motorchoach style buses, mini buses, and luxury vans ranging from 10 to 59 passengers, with leg room, air conditioning, and large windows. Alaska Cruise Transportation BIG BUS does not just offer cruise ship transportation. We offer Alaska bus rental with our fleet of modern motorcoaches, mini buses, and vans. We provide ground bus transportation for many conferences, weddings, meetings, and events in Anchorage, Girdwood, Seward, Talkeetna. Our professional drivers provide excellent customer service for your important guests. Our prices are the most competitive and affordable on the market, our buses rent as low as $95 per hour for up to 45 people. Contact us to get the best value for Alaska Bus Rental in Anchorage. 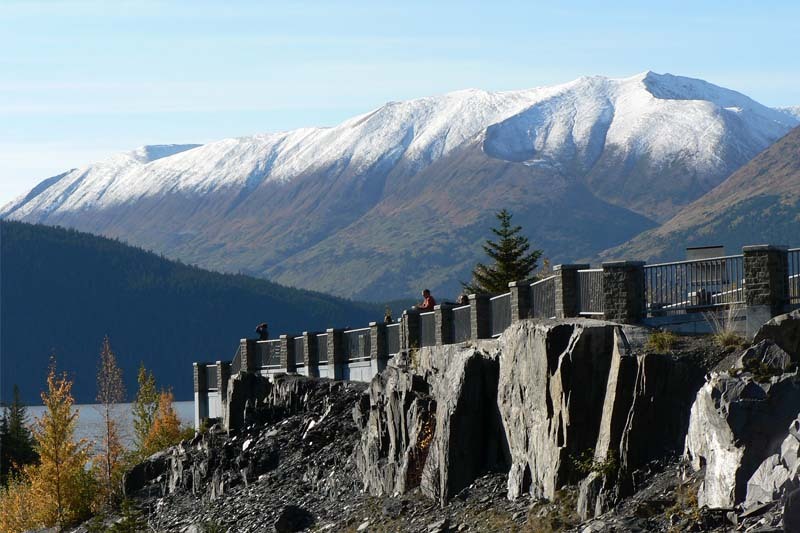 We travel on Seward Highway which is in the Top Ten most Scenic Hwys in US! Why choose us? Equipment, Equipment, Equipment. 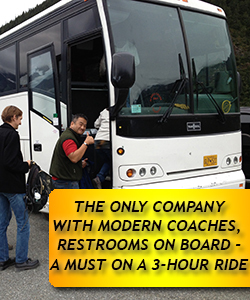 We are the only company in the area to use modern, coach style buses with restroom on board - we don’t waste customers’ time to stop for ”out houses” on our way, we give you more time to enjoy scenery and not on waiting in line for restroom. We show you more with less time than other companies. Don’t be sorry you did not book with us when you see another guy’s bus. Pick up and drop off directly at the cruise ship or Anchorage hotels, airport, car rentals. 1.5 hour transfer. Fully narrated transfer allows you to learn the history and scenery that surrounds you while traveling on one of the most scenic highways in Alaska, Portage Glacier Lake (drive by), Turnagain Arm - (drive by) dall sheep, beluga whales. Drop off directly at the cruise ship or Anchorage (hotels, airport, or car rentals). Pick up directly at Anchorage hotels and airport. 1.5 hour transfer. Fully narrated transfer allows you to learn the history and scenery that surrounds you while traveling on one of the most scenic highways in Alaska, Portage Glacier Lake (drive by), Turnagain Arm - (drive by) dall sheep, beluga whales. Drop off directly at the cruise ship. Pick up directly at the cruise ship terminal. 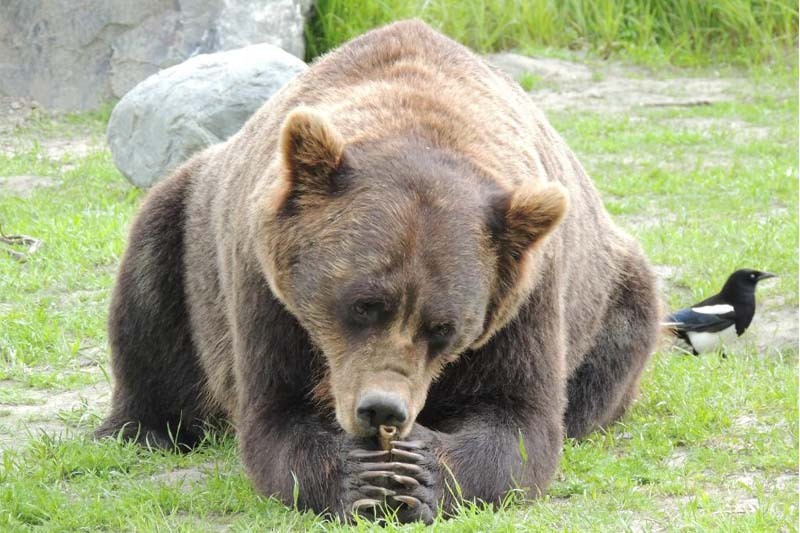 Fully narrated wildlife tour allows you to learn the history and scenery that surrounds you while traveling on one of the most scenic highways in Alaska. Pick up Whittier cruise ship terminal; Short tour of the largest city in Alaska - Anchorage (drive through); Turnagain Arm - dall sheep, beluga whales (drive thru); Alaska Wildlife Conservation Center with the perfect picture opportunity for Bears, Moose, Caribou, Bison, Musk Oxen, Deer, Elk, bold eagle. 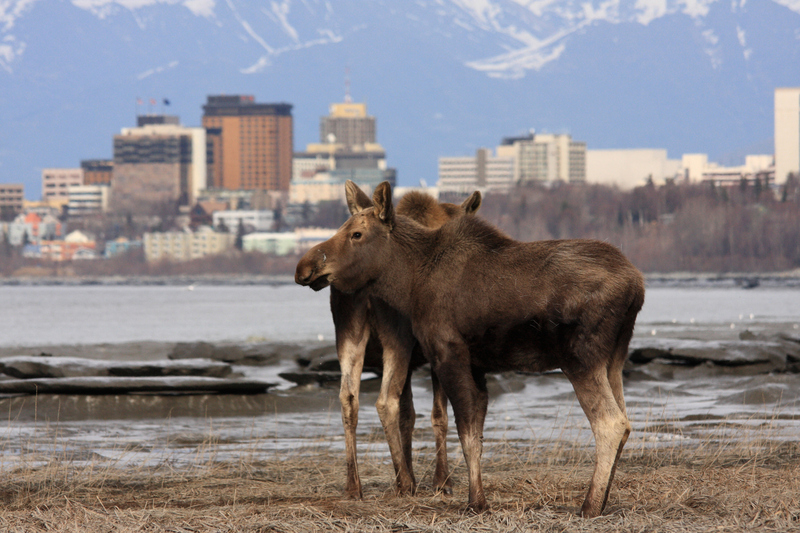 See www.alaskawildlife.org, Drop off Anchorage hotels, car rentals, airport. Pick up directly at Anchorage hotels and airport. Fully narrated transfer allows you to learn the history and scenery that surrounds you while traveling on one of the most scenic highways in Alaska. Pick up Anchorage airport, hotels, car rentals; Short tour of the largest city in Alaska - Anchorage; Turnagain Arm - dall sheep, beluga whales (photo stop); Alaska Wildlife Conservation Center with the perfect picture opportunity for Bears, Moose, Caribou, Bison, Musk Oxen, Deer, Elk, bold eagle. See www.alaskawildlife.org. Stop at the Portage Glacier Lake for amazing photo opportunities of hanging glaciers. Drop off directly at the cruise ship terminal. Pick up and drop off directly at the cruise ship terminal. FAMOUS ALYESKA MOUNTAIN TRAM TICKETS INCLUDED IN THE PRICE AND MUCH MORE! Includes all popular attractions and lunch to keep you entertained for the day. Transportation between Whittier and Anchorage Alaska with the best shuttle bus company. Finding a bus transportation options to get to or from your cruise line in Alaska is not always an easy task. For the best shuttle transfer transportation service between Whittier and Anchorage Alaska, Anchorage to Whittier, Whittier to Anchorage or Anchorage to Whittier you should consider www.alaskacruisetransfer.com. With our company you can experience a variety of different bus transfer and tour options between these areas as well as some standard transportation between Seward, Whittier and Anchorage Alaska. When you choose our company for your shuttle bus transfer or tour transportation between Whittier and Anchorage, Anchorage to Whittier or Whittier to Anchorage, Anchorage to Whittier, you can count make sure you are traveling with the most reputable company and a leading Alaska cruise bus transportation provider. We are the only company in the area that uses modern, coach style buses with restroom on board, you will travel in style, comfort, and safety if you choose our company to transfer you or your important group from Whittier cruise ship terminal to Anchorage airport or hotels or from Anchorage to Whittier cruise port. Your safety and comfort is our priority and we want you to be wise when choosing your bus transportation company and inquire about their equipment to avoid an unpleasant surprise. Our Anchorage to Whittier wildlife bus transfer will pick up at area hotels, airport and some car rentals and will break the long drive with a scenic and convenient stop at the wildlife center and picture stops so you can enjoy the sights and take some pictures home. The wildlife center stop makes this shuttle transfer enjoyable where you can get out of the bus for a short while, take pictures, grab a snack, and stretch your legs. Our friendly and attentive drivers/guides have many years experience in customer service and will meet you with a smile, caring attention to your needs, and a friendly interaction when appropriate. We make your transportation service provider between Whittier cruise ship terminal and/or Anchorage airport, hotel stress free and reliable. Whittier Alaska Transportation options: If you are traveling from Whittier to Anchorage or Anchorage to Whittier, we provide the most reliable, efficient, and overall best way to travel between those cities. Our shuttle service is conveniently coordinated with every cruise ship arrival and departure, our shuttle tour service between Anchorage and Whittier Alaska offers the professionally narrated tour with stops at Wildlife Park, Portage Glacier, and goes through Anton Anderson memorial tunnel which is the longest tunnel in North America along the most beautiful Seward highway. The distance between Whittier and Anchorage is about 60 miles and covers the most beautiful scenery when driving on the highway. Why take a train or rent a car or taxi in Whittier or Anchorage Alaska when you can save money and our environment using our economical shuttle bus service between Anchorage airport or hotels to Whittier Princess cruise ship pier. Our transportation service between Whittier and Anchorage is done via motor coaches, mini buses - which are most comfortable with large windows, much leg room, professional narration and licensed drivers driven to make your vacation the most memorable and comfortable. Most shuttle services pick up or drop off at one specific location. Our service will pick you up and drop you off at the location of your choice (limited to airport, hotels and car rentals in downtown, midtown and airport area). 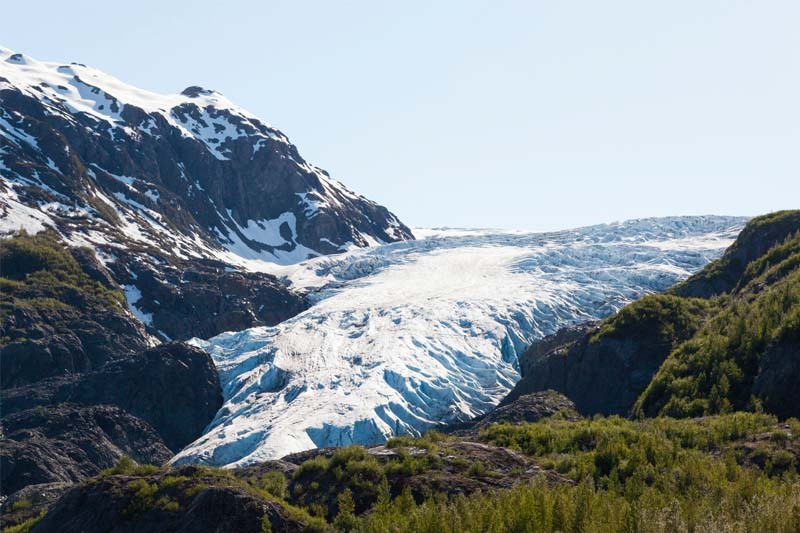 Offering a fully narrated shuttle service AND a comprehensive tour option with the transfer from Whittier to Anchorage and Anchorage to Whittier, we don't want you to feel like you've missed something just looking out the window on one of the most beautiful highways. Our company uses only coaches, which means that you are safe because unlike vans or limousines coaches are required to follow DOT safety standards: full commercial insurance coverage, commercial driver license to operate the vehicle. Comfortable, facing forward seats for every passenger, large picture view windows, easy step up, large luggage section. Whittier Alaska cruise terminal to Anchorage airport or hotels is the distance of about 60 miles including the North America's longest tunnel and usually takes 1.5 hours traveling by coach or bus. Your options are unlimited with our Whittier shuttle transportation - you can choose to go by a large motorcoach, mid-size coaches, small mini buses or luxury vans, Anchorage limousines, car rentals. We will provide your Alaska cruise transportation from Whittier to Anchorage or Anchorage to Whittier. Getting to Whittier port from Anchorage never sounded so good with our professionally narrated recording that is coordinated with the Seward highway and will drive from Anchorage to Whittier Alaska. Whittier Alaska car rental, taxi from Whittier to Anchorage, Whittier train rail tours are all great choices to travel from Whittier to Anchorage, however our Whittier Alaska ground transportation in our most comfortable coaches, buses, limousines, vans, shuttles is the most time efficient, scenic, and most popular way to travel between Seward, Anchorage, Whittier, Denali, Talkeetna. Whittier port to Anchorage airport cruise transfers and how to get to Anchorage from Whittier and transportation from the port in Whittier, Alaska to Anchorage are most frequently searched questions and we are your best option for transportation by motorcoach, bus, or shuttle from Anchorage to Whittier, Whittier to Anchorage. Alaska Cruise Transfers is the most recognized name for Anchorage day trips to Whittier, since flying to Whittier Alaska is not an option, drive time Anchorage to Whittier is about 1.5 hours and offers the most scenic answer for question of how to get from Whittier AK to Anchorage AK.